For the past 25 years, Amizade has provided global service learning opportunities to more than 12,000 people in 12 countries which span four continents. This January, they launched the Hill District Global Engagement Coalition. Earlier this fall, Hill District community leaders selected 30 student ambassadors from high schools in the Hill District to participate in the nine-month program which will allow each student to participate in service learning in both Pittsburgh and in an Amizade site abroad. Amizade hopes interaction between student ambassadors and their host country communities will have a positive impact on the students and that they will return home wanting to share their experience with the larger Hill District community. Students who have access to global education have demonstrated improved academic achievement, increased civic engagement, and better employment opportunities in their future. The Global Engagement Coalition aims to minimize this inequity by providing global service learning opportunities to high school students in the Hill District who wouldn’t otherwise have access to international experiences. Ambassadors are meeting with their partner organization once a month to workshop skills such as peer mediation and project management and to learn about the history of colonization and slavery. By September, each cohort of students is expected to have planned and implemented their community service project in the Hill District. Because there often is a lack of black history education in schools, many black students have to strengthen their identity and understanding of their ancestral history elsewhere. The Hill District Global Engagement Coalition aims to bridge the gap in education by sending students to countries in which people were colonized, enslaved, and brought to countries such as the United States. To help them carry out this project, Amizade has enlisted the help of three Hill District organizations — Ujamaa Collective, Reaching Back, and Center that CARES — each of which is sharing their organization’s mission and approach to community engagement with 10 students on the program. This June, students will travel to Ghana, Jamaica, and Trinidad & Tobago (respectively) for 7-10 days with two staff from their partner organization, an Amizade staff member, and the other ambassadors in their cohort. 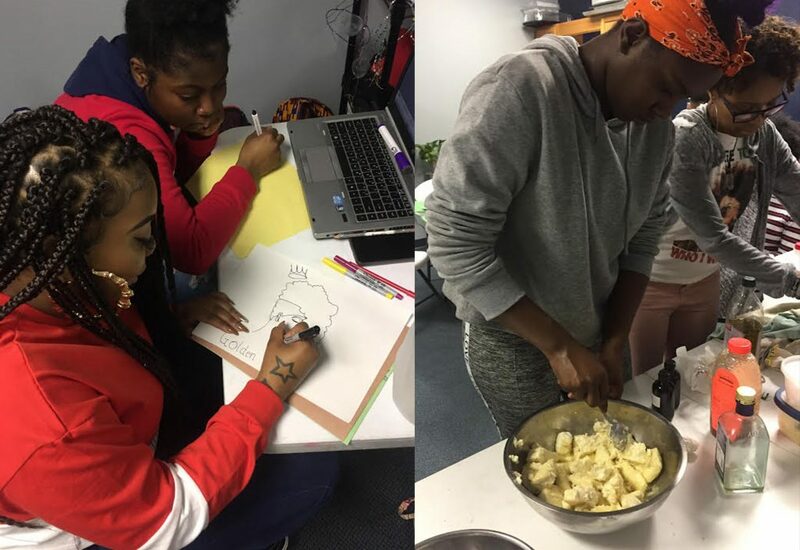 Student ambassadors paired with Ujamaa Collective in Amizade’s Hill District Global Engagement Coalition prepare hand made shea butter body products to raise funds for their trip to Ghana. Ambassadors traveling to Ghana will visit the ‘Door of No Return’ which was the last sight of Africa for many people who were enslaved and forced out of their country on ships. Whereas students traveling to Jamaica and Trinidad will visit the ports of entry that enslaved people went through upon their arrival. Amizade hopes student ambassadors will develop an appreciation for their ancestral history and black identity as well as a deepened understanding of colonization and slavery, and the way in which their harmful legacies continue to affect the world today. Getting funding for the Hill District Global Engagement Coalition was a process that spanned several years. Amizade has not yet obtained funding for their 2020 cohort of students, but they hope to partner with more organizations, double the project’s reach to 60 students, and expand the scope of the project by adding the neighborhoods of Westinghouse and Homewood. If you are interested in supporting the Hill District Global Engagement Coalition or Amizade’s other initiatives, click here. This post was produced through an interview with Amizade’s Tyisha Burroughs and was written by Anna Bongardino, a Spring 2019 intern for The Global Switchboard.